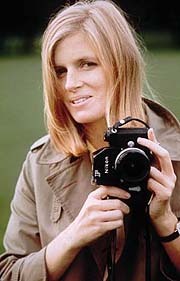 Linda McCartney | All You Need Is News! Linda Louise, Lady McCartney (née Eastman; formerly See; September 24, 1941 – April 17, 1998) was an American musician, photographer and animal rights activist, entrepreneur and publisher and was married to Paul McCartney of the Beatles. Eastman and McCartney were married in 1969 with their marriage blessed at St John’s Wood Church in London. Her daughter, Heather Louise, from her first marriage to Joseph See, was adopted by her new husband the same year of their marriage. Together, the McCartneys had three children: Mary Anna, Stella Nina, and James Louis. McCartney and her husband later formed the band Wings. She wrote several vegetarian cookbooks and became a business entrepreneur, starting the Linda McCartney Foods company with her husband. Prior to her second marriage, McCartney was a professional photographer, later publishing Linda McCartney’s Sixties: Portrait of an Era. McCartney was diagnosed with breast cancer in 1995, and died at the age of 56 on April 17, 1998, in Tucson, Arizona, at their ranch.